.switch to our VoIP phone system today! Relax VoIP Phone Systems provides cloud based telephony, offering high end functionality of a full PBX telephone system, at the fraction of the cost. 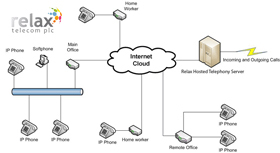 Completely hosted and supported by Relax, the system utilises a high speed internet connection to make and receive calls. Relax will fully tailor the system to every customer, allowing flexibility for all office structures - be it a single site office, chain of home workers or large multi-site corporations. Location is not an issue and the system can easily link national and international sites. We have a full range of Non Geographical numbers available for all types of business and can provide attractive revenue share schemes.